Succinyl-coenzyme A, abbreviated as succinyl-CoA (/ˌsʌksɪnəlˌkoʊˈeɪ/) or SucCoA, is a combination of succinic acid and coenzyme A. It is an important intermediate in the citric acid cycle, where it is synthesized from α-ketoglutarate by α-ketoglutarate dehydrogenase through decarboxylation. During the process, coenzyme A is added. With B12 as an enzymatic cofactor, it is also synthesized from propionyl CoA, the odd-numbered fatty acid, which cannot undergo beta-oxidation. Propionyl-CoA is carboxylated to D-methylmalonyl-CoA, isomerized to L-methylmalonyl-CoA, and rearranged to yield succinyl-CoA via a vitamin B12-dependent enzyme. Succinyl-CoA is an intermediate of the citric acid cycle and can be readily incorporated there. It is converted into succinate through the hydrolytic release of coenzyme A by succinyl-CoA synthetase (succinate thiokinase). Another fate of succinyl-CoA is porphyrin synthesis, where succinyl-CoA and glycine are combined by ALA synthase to form δ-aminolevulinic acid (dALA). Succinyl CoA can be formed from methylmalonyl CoA through the utilization of deoxyadenosyl-B12 (deoxyadenosylcobalamin) by the enzyme methylmalonyl-CoA mutase. This reaction, which requires vitamin B12 as a cofactor, is important in the catabolism of some branched-chain amino acids as well as odd-chain fatty acids. 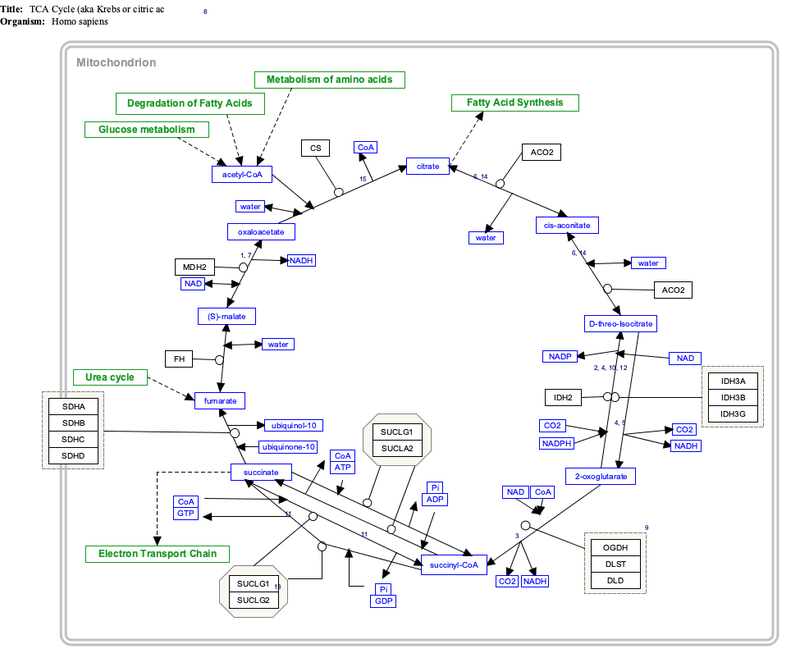 ^ The interactive pathway map can be edited at WikiPathways: "TCACycle_WP78". ^ Halarnkar PP, Blomquist GJ (1989). "Comparative aspects of propionate metabolism". Comp. Biochem. Physiol., B. 92 (2): 227–31. doi:10.1016/0305-0491(89)90270-8. PMID 2647392.